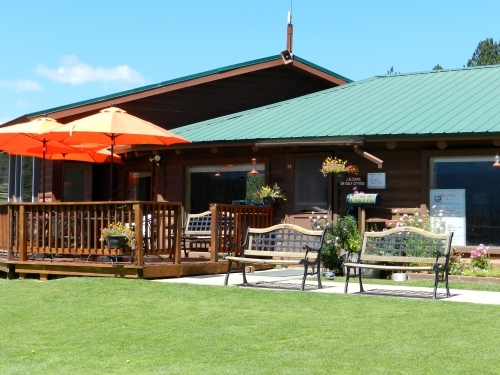 The Clubhouse is open annually from mid-May to the end of September. We are a deli bar operation with a full service liquor license. The hours of operation are 8am - 6pm daily with food service until 4:30 pm. Pizza may be ordered after 4:30 pm. On Friday evenings the clubhouse has Happy Hour and stays open until 9 pm. We have clubs and hand-pulled golf carts for rent. We also carry a variety of golf merchandise - including tees, golf balls, hats, shirts, hoodies, vests, jackets, gloves, and umbrellas. Check often as the inventory changes. We offer breakfast and lunch- the menu below reflects this summer's menu. We are always trying new items, so keep checking back for the latest additions. We consider our clubhouse a "place to hang" reminiscent of Cheers. We have homeowner social hours, potlucks, special programs, special menu items and drinks in an effort to keep the community spirit alive. Please check out our calendar of events for something that may interest you. We hope to see you often (at least weekly) all summer!  House Salad: Mixed greens, tomato, cucumber, and carrots.  Garden Salad: Mixed greens, tomato, onion, carrots, cucumbers, artichoke hearts, green olives, pepperoncini, green pepper, topped with feta.  Green Chile Stew: Topped with diced tomato, onion, and cheese. Comes with tortilla chips. Friday Happy Hour from 5 to 9! Boars Head hot dogs are ¼ lb., all beef, and do not include byproducts.